What could Half-Life 3 have learned from Dark Souls? Every now and again, erstwhile Half-Life writer Marc Laidlaw talks wistfully about his hopes for the series – and we all wistfully return there with him, reminiscing about a brave boy named Gordon who kept on getting into scrapes with aliens. In a recent interview, however, Laidlaw mentioned that his favourite game isn’t Half-Life 2. It’s Dark Souls. At the moment he said it, something clicked – Half-Life, Dark Souls, the connection makes sense. It was enough to bring Dark Souls devotee Rich and Half-Life mourner Jeremy together, to have a nice chat about why Laidlaw’s pick of favourite game makes sense. Here, Rich and Jeremy discuss what the two games have in common, and whether one could stand to learn from the other. Half-Life is a hall of famer in the best FPS games on PC. Jeremy: Hi Rich. When was the last time you thought about the Half-Life story? I remember it was quite important to me at one time, but it’s since drifted into a fuzzier realm of sentimental fondness. Rich: Hey Jeremy! 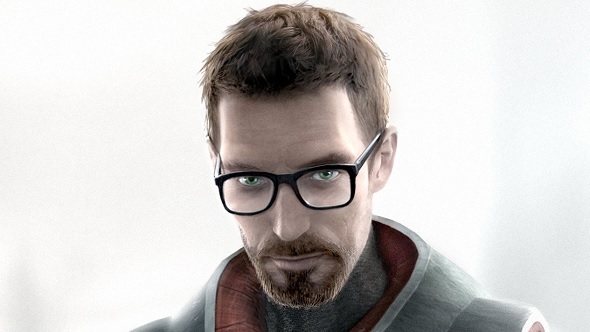 To be honest, Half-Life’s story didn’t have much of an impact on me – the first game affected me much more than the second, and its story was pretty minimal. It was richer in Half-Life 2, but even then it never felt like much more than context, which is why I found Laidlaw’s comments about Dark Souls so interesting. 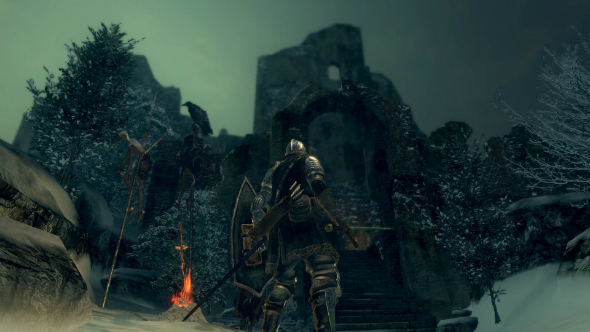 I think most players also see Dark Souls’s story as context, but I’m the mirror of you in the sense that, having explored it, it’s become very important to my enjoyment of the series at this point. Jeremy: Sure. I’m a bit jealous of that perspective on Dark Souls, to be honest. 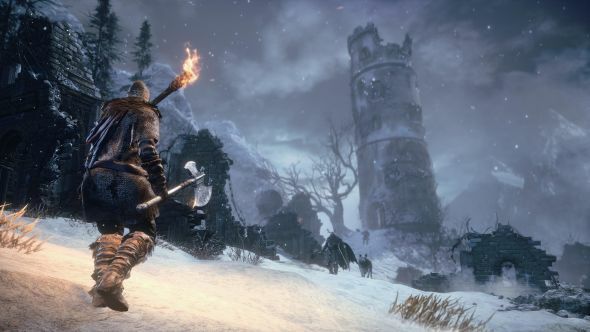 I’m relatively clueless on the series – I’ve played 20 hours of Dark Souls 2, which I gather is like playing less than nothing in the eyes of Souls diehards. But the reason I bought it in the first place is that I read a couple of great, in-depth pieces about Dark Souls lore. I was left with this idea of a twisty, subtle narrative with recurring characters, baked into the stone of Lordran. When I played the first sequel, though, it seemed buried so far into the background that I never got to experience any of that. Something changes once you lose yourself to the game, does it? Rich: The first sequel is weird; it goes off on its own tangents, which I mainly attribute to Miyazaki sitting it out. You sense his involvement on the third game in so many ways, especially when it comes to the lore – it feels like he’s struggling against the second to wrestle the series back into focus. We could talk about the importance of a single directorial vision even in a collaborative medium like videogames, or what the Dark Souls trilogy could’ve been if it’d had that, but that’s a chat for a different day. 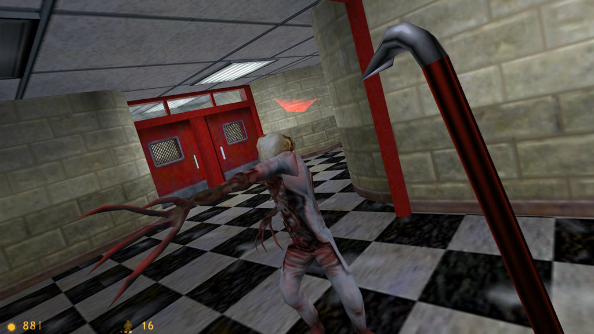 Returning to Half-Life, Laidlaw said he was just aiming to create the illusion of depth with the original game’s story, and that he “pushed it a bit” for the sequel as Valve gained confidence. Similarly, it’s often said that Dark Souls feels like a coherent world because its story is there and it’s rich, but you have to go looking for it. For me, the difference is there’s less ability for the player to pursue the story in Half-Life, whereas they’re really rewarded for doing so in Dark Souls. Do you think that’s fair? Jeremy: I think I’d go further still, and say that Half-Life is dependent on your inability to go out and explore beyond its strict limits. The most commonly cited bit of storytelling in that game is the opening train ride into Black Mesa – a literally on-rails sequence. Rich: I loved that. First moment I realised just how different and special the game was going to be, in the context of other ’90s shooters. Jeremy: Yeah, and it still stands up as a piece of tightly-controlled direction. The carriage allows you only odd glimpses at heavy machinery, blast doors, and rockets – enough to provide a disconcerting undertone to your briefing on emergency protocols and radiation safety. As an intro it remains a lesson in building foreboding, suggesting there’s far more going on at Black Mesa beyond those cavern walls. Which, of course, there isn’t. That’s the illusion Laidlaw talks about. I think, understandably, people tend to misremember Half-Life as a story and dialogue-driven game, the way Half-Life 2 was. Instead, it’s only concerned with delivering a specific atmosphere and just enough coherence for players to run wild in their heads. You could describe Dark Souls in the same way, and perhaps that’s why Laidlaw likes it. As you’ve said, there’s the option to dig further into Souls’ mysteries if you want to. Have you done that yourself? Rich: Yes, indeed, with some help from VaatiVidya and others. Perhaps inadvertently, Miyazaki made the perfect game for the social media era. Going on YouTube and Reddit to investigate both what’s explicit but easily overlooked, as well as more speculative theories connecting the dots, adds a really enriching layer to Dark Souls and gives content creators plenty to do. As you say, I can see why Laidlaw likes it, and I can see why it’d appeal to Valve more broadly, given their strategic emphasis on community-building. Not for the first time, it makes me wonder what Half-Life 3 would’ve been like. Maybe more of an immersive sim, still in first-person with great shooting, but blending Deus Ex or BioShock-style storytelling with some of Dark Souls’s obscurity? I’d play the hell out of that. 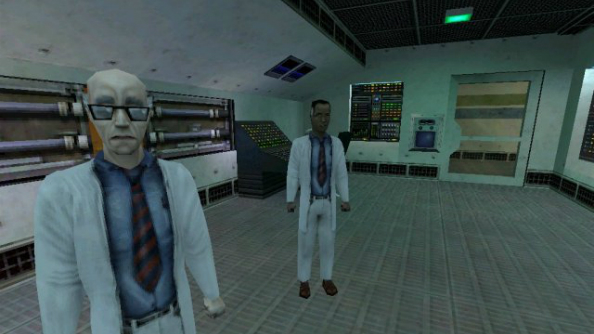 Half-Life’s two alien races – and especially the G-Man – are mysterious yet hint at depth in exactly the right ways for that kind of game to explore. I’m sure – Valve being Valve – they would’ve come up with a missing ingredient beyond our powers to predict, as well. With your Half-Life knowledge, what would you have wanted to see in the third, and do you think Dark Souls could’ve had anything to teach it? Jeremy: I do think Half-Life 3 could’ve learned a thing or two from Dark Souls about letting players dig deeper into its background, yeah. In fact I think Valve were heading that way with Left 4 Dead which, through dint of being multiplayer, told most of its story contextually. It was only over time, listening to various combinations of soundbites and reading the messages scrawled on the walls of safe houses, that you could begin to learn what had happened to Left 4 Dead’s version of America. As for those immersive sim elements: Valve’s hiring of Thief’s Doug Church and Far Cry 2’s Clint Hocking was always an incredibly tantalising development. But like Laidlaw, Hocking eventually left without another game to his name. As Valve increasingly dedicate themselves to serving Dota 2 and Counter-Strike, I think we’ll always be talking could’ve beens when it comes to Valve asas single-player storytellers. Rich: Oh yeah, no question, that’s why I’ve been speaking in the past tense this whole time. Half-Life 3 will never happen and I’ve made my peace with that. Still, it’s fun to dream, isn’t it? Jeremy: It is. I hope the sleep is sweet in stasis, Gordon. Thanks for the memories.